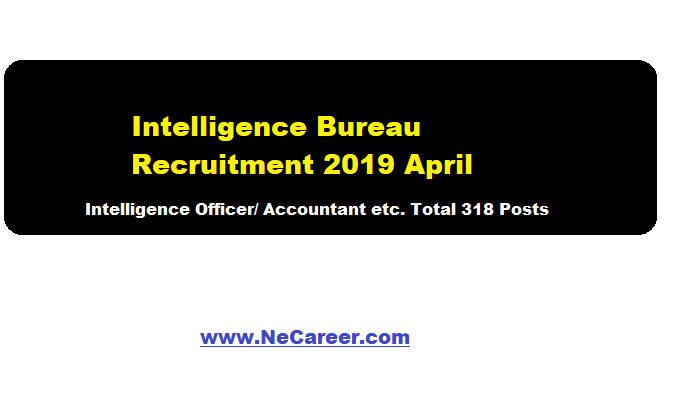 Intelligence Bureau Recruitment 2019 April | Intelligence Officer, Accountant and various posts (318 nos):- Welcome to North East India's No. 1 Job Portal NeCareer.com .Intelligence Bureau has issued a job notification in April 2019 for total 318 vacancies in different posts. Interested and eligible candidates can submit applications to the Joint Deputy Director/G. Intelligence Bureau, Ministry of Home Affairs, 35 S.P. Marg, Bapu Dham, New Delhi-21 within 60 days (17 April) from the date of issuance of this circular.